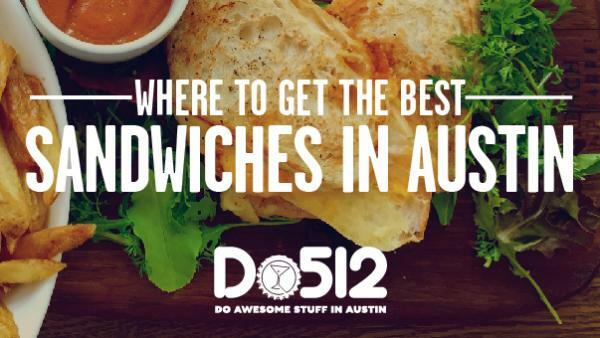 From finger licking barbecue delights to variations on bahn mi and deluxe grilled cheese, Austin has a long list of legendary sandwiches. Whether it’ s a hoagie, sub, hero, or just a plain old sandwich, here&apos;s a few of the sandwiches that make Austin proud on National Sandwich Day and every day. House Báhn Mi Elizabeth Street Cafe 1501 S. First St. This sweet south side restaurant has found the perfect balance of refined French, innovative Vietnamese and eclectic Austin. Check out their refined House Báhn Mi: rich chicken liver mousse, pork pate, and savory roasted pork served traditional báhn mi-style with house-made mayo, cucumber, daikon, carrot, sambol, and cilantro and jalapeno on a fresh baguette. Muffaletta The ABGB 1305 W. Oltorf St. This pizzeria/live music venue/beer garden is also an all-the-time server of a great Italian sub. 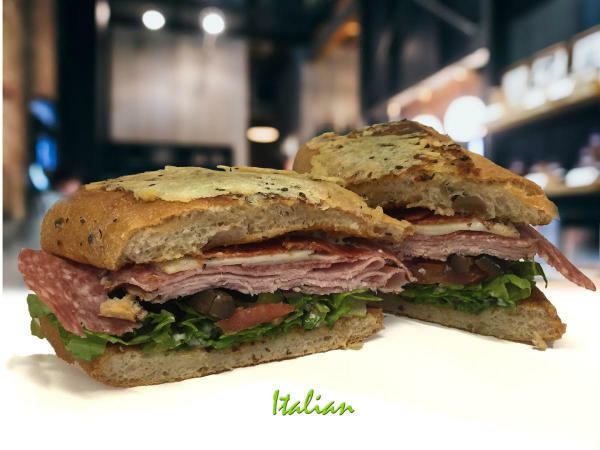 Fresh-baked ciabatta bread is stuffed with all things Italian: ham, mortadella, provolone and house-made olive salad. Lamb Burger Salt & Time 1912 E. Seventh St. This East Austin butcher shop has become famous for their responsibly-sourced meats straight from Texas ranchers. The butcher shop features a wide array of select meats to craft your own sandwich, or you can choose a regular menu item. The Lamb Burger features greens, shaved fennel, queso fresco, hot sauce crème fraîche on brioche. The Italian Toasties 215 S. Lamar Blvd. This "little sandwich shop that could" is one of Austin’ s favorite sub shops, with four Austin locations and a whole lotta sandwiches to choose from. Try The Italian: ham, salami, pepperoni, provolone cheese, lettuce, tomato, red onion, bell pepper, black olives and mayo, drizzled with oil and vinegar and served on a parmesan-crusted toasted hoagie. Patty Melt Dai Due 2406 Manor Rd. While a patty melt may elicit images of greasy diner-style patties between two pieces of white bread, Dai Due’s bougie take is sure to change your image for good. 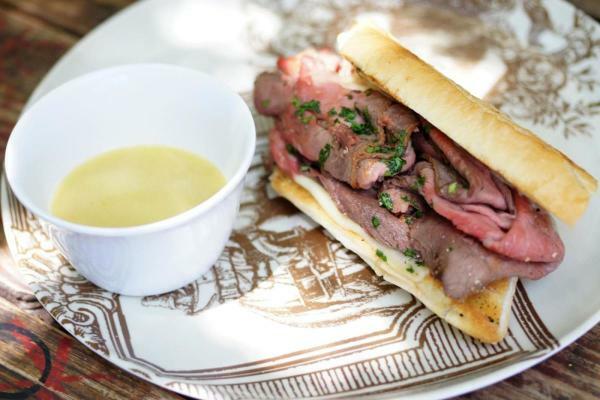 The butcher shop prides itself on an extraordinary butcher program making for the perfect sandwiches. Juicy patties are topped with caramelized onions, mushrooms, Stryk cheddar, and a special sauce on crispy pieces of rye. It is guaranteed to melt in your mouth. Knuckle Sandwich Noble Sandwich Co. 4805 Burnet Rd. Carlos G’ s Dynamite Deli 2312 S. First St. This south side deli serves up sandwiches, paninis, soup, and salads that are, well, dynamite. The Carlos Panini features piping hot jalapeno cheddar bread stuffed with turkey, provolone, bacon, tomato, spinach, avocado and smothered in pesto mayo with a side of jalapeno. So cheesy, so meaty, so delicious. Dessert Grilled Cheese Toaster 1910 E. Cesar Chavez St. Located on the back patio of Stay Gold, Toaster has been serving East Austin regulars for the past year. The Dessert Grilled Cheese is the perfect way to end your night or just start it: blueberry, blackberry, brie and dark chocolate melt together in utter deliciousness. The O.G. Burro Cheese Kitchen 1221 S. Congress Ave. These ain&apos;t the grilled cheese sandwiches from your childhood, these bad boys are matured with artisanal cheese and innovative ingredients served out of a food truck located on South Congress. Make sure to sample The OG: ooey gooey Havarti cheese between two pieces of sweet King&apos;s Hawaiian bread. So simple, so good. Bac&apos;n Cheeze Burger Arlo’s 900 Red River St. 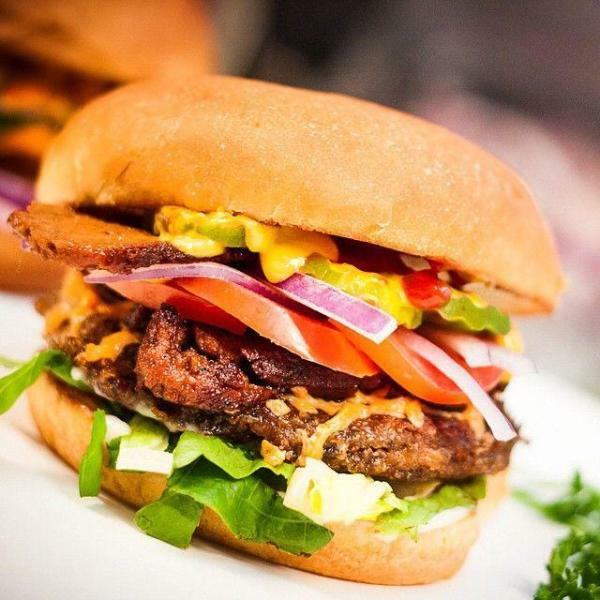 This trailer serves up some of the best vegan comfort food in town, including the amazing Bacon Cheeze Burger. House-made soy free and gluten free patty, stacked with house-made seitan bac&apos;n, melted cheeze, mayo, ketchup, mustard, tomatoes, onions, pickles and lettuce. The Rabbit Luke’ s Inside Out 1109 S. Lamar Blvd. 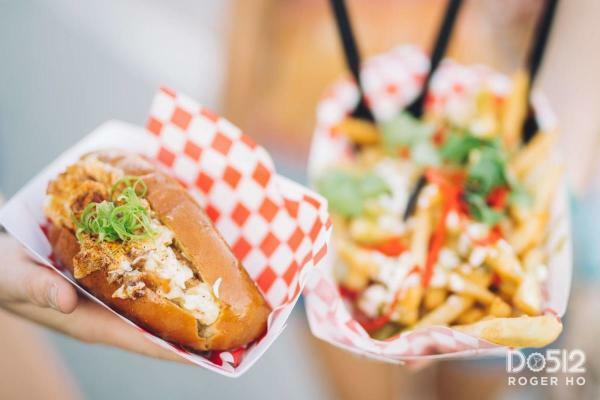 Featured on Diners, Drive ins, and Dives, this food trailer outside of Gibson Bar has lived up to the hype - with innovative ingredients and creative spins on classic bar foods. Check out The Rabbit: a griddled sandwich heaped with Korean BBQ, kimchi, tater tots, and topped with a tangy house-made koreachup. The Cleopatra Gourmands 2316 Webberville Rd. This neighborhood pub brings sandwiches with a punch: quality ingredients, hand-sliced meats and cheeses, and damn good soups. If you are looking for a veggie sandwich that never disappoints, check out the Cleopatra: a fat sandwich loaded with havarti, marinated artichokes, black olives, spicy poblanos, fresh cucumbers and sprouts, avocado and a roasted garlic mayo. Sliced, grilled, and seasoned to perfection. This 1909 original grocery in Hyde Park has become an iconic Austin establishment, with unique atmosphere, local groceries, and a great deli of homemade sandwiches. We suggest the “Queen B” a local favorite loaded with avocado, three kinds of cheeses, mushrooms, and jalapeno. The perfect blend of cheesy, spicy, and delicious. The Big Bad Wolf Republic of Sandwich 2320 Hancock Dr. 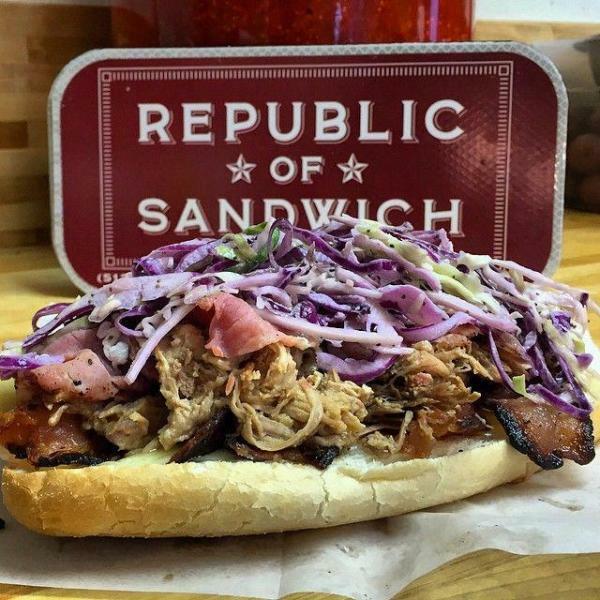 Specializing in chef-driven house cured meats and artisanal sides, it’s safe to say Republic of Sandwich can really make a sandwich. Tantalize your taste buds with the Big Bad Wolf: a decadent ‘ which composed of tender roast pork, ham, crispy bacon strips, and provolone and a celery seed coleslaw. Canadian Tuxedo Austin Daily Press 1900 E. Martin Luther King Jr Blvd. Serving up original tortas, ciabattas, paninis and brioche, Austin Daily Press has a wide array of global and domestic flavors to satisfy your sandwich needs. A local favorite is the Canadian Tuxedo. A taqueria style torta topped with roasted chicken, tangy pickles, cheddar, aioli, and an exquisite black pepper maple gastrique. Courtesy Yellow Jacket Social Club. French Dip Special Yellow Jacket Social Club 1704 E. Fifth St. This old-school dive bar is renowned for bikers, loud music, and perhaps some of the best charcuterie and cheese plates in town. In between rocking out, check out their French Dip Special. It truly has to be tasted to be believed. Pesto Chicken Salad Fricano&apos;s 2405 Nueces St.
With cheap prices and hearty servings, Fricano’s has been slinging campus favorites since 2006. 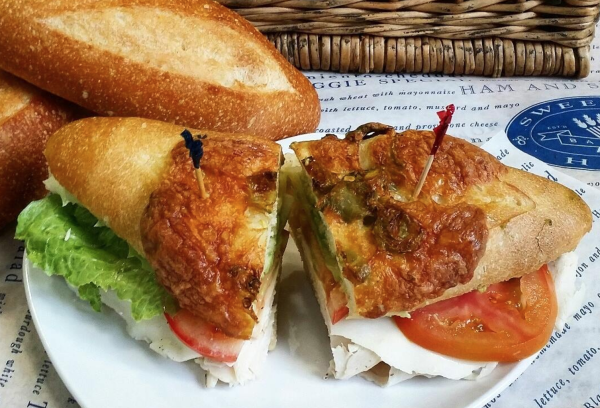 Get your hands on their delightful Pesto Chicken Salad Sandwich: tender chicken breast tossed with housemade pesto mayo, spicy poblano peppers, and purple onions. Gypsy Grove FoodHeads 616 W. 34th St. This house converted into a sub shop near campus is the epitome of Austin - eclectic, cozy, a little weird, but most importantly a campus go-to for amazing sandwiches. The Gypsy Grove brings together savory, tangy and spicy with tender marinated pork tenderloin and grilled ham topped with Swiss cheese, a jalapeno relish, Tabasco slaw, and a fried egg atop a ciabatta bun. The Friday Sandwich Sweetish Hill Bakery 1120 W. Sixth St.
A taste of Paris in the heart of Texas: this European style bakery and cafe serves up fresh-made soups, sandwiches, and pastries from classic French methods. The Friday Sandwich gives us another reason to TGIF: turkey and avocado are served on a spicy serrano cheese baguette. The New Jersey Sloppy Joe NeWorlDeli 4101 Guadalupe St. This family-run deli in central Austin creates some of the best sandwiches in town, alongside live music and a warm atmosphere. If you have a big appetite chomp on the New Jersey style Sloppy Joe: a mammoth double-decker served on Jewish rye with a selection of turkey, ham, roast beef or get all three. Topped with Swiss cheese, cole slaw, and Russian dressing. The Haymaker Haymaker 2310 Manor Rd. A little bit of Texas, a little bit of the Midwest, and a whole lot of amazing sandwiches. This neighborhood bar serves up regional comfort food a la gravy, fries, cheese, and a whole lot of poutine. Get the Haymaker: this open faced sandwich on Texas toast includes rare roast beef topped with french fries, slaw, tomatoes, and a fried egg all smothered in a savory house-made gruyère sauce. Garbo&apos;s. Credit Roger Ho, courtesy Do512. Connecticut Style Lobster Roll Garbo&apos;s Lobster Truck 14735 Bratton Ln. This famed food truck serves up New England cuisine with an Austin twist, and the best lobster rolls in the city. You have to get the CT-style lobster roll: fresh lobster warmed in butter tossed in house-made mayo and served in a warm roll. Too good to be true. Corned Beef Easy Tiger 709 E. Sixth St. This beer garden complete with trivia nights and ping pong tables also happens to serve up the best bread, pastries, and beer in town. While all of the sandwiches are fantastic, their Corned Beef Sandwich is a whole new level of awesomeness: house-made tender corned beef topped with tangy mustard on freshly baked rye bread. The Balboa Way South Philly 1209 E. Sixth St.
How could we even think about creating a sandwich list without mentioning the amazingness that is Way South Philly? 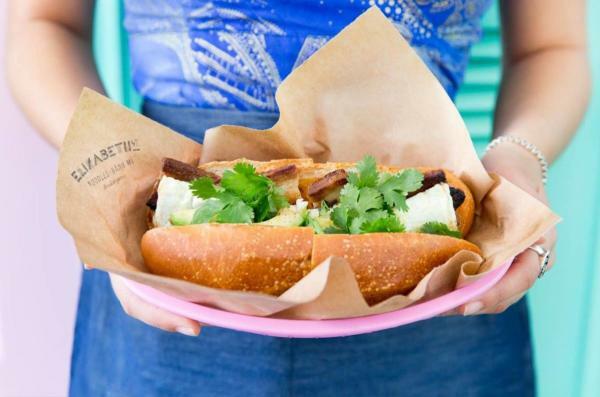 This East Austin food truck serves up Philly cheese steaks done right. Whether you’re looking for late night drunk food or a perfect hot sandwich for dinner, check out the Balboa: tender seasoned grilled Philly steak sauteed with steamed onions and topped with their own Cheez Whiz. Franklin BBQ. Credit FoodNetwork, courtesy Do512. The Tipsy Texan Franklin BBQ 900 E. 11th St.
Franklin Barbecue is without a doubt some of the best barbecue in Texas, and perhaps the world. So it’ s safe to say they can do a BBQ sandwich the right way. 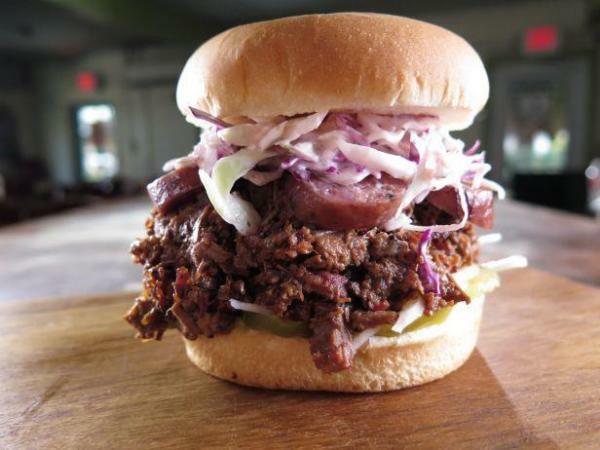 If you stand in the line, make sure to get the Tipsy Texan: tender mouth watering brisket, savory sausage, pickles, and cole slaw. It&apos;s drool-worthy. Crawfish Po’ Boy Turf’ n’ Surf Po’ Boy 407 Lavaca St.
Austin is a long drive from New Orleans, meaning it used be hard to get a good po’ boy in this town. That is until Turf’ n’ Surf popped up. Located adjacent to Lavaca Street Bar, Turf serves up delicious traditional style po&apos; boys with high quality, wild caught ingredients. Get dirty with the Blackened Crawfish Po&apos; Boy: crispy, crunchy blackened crawfish served on New Orleans-style French bread. Contributed by Page Jensen-Slattengren, for Do512.com.